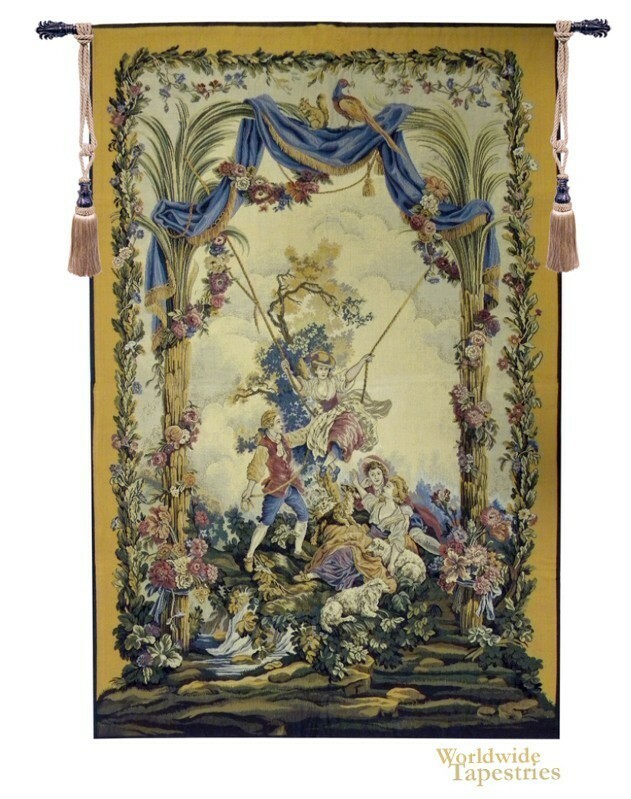 Designed by Jean-Baptiste Huet (1745-1811), “The swing” was woven in 1780 by Beauvais in France. It is part of a series of pastorals designed by Huet. The original is in the Louvre in Paris. “The swing” is a delightful flight of fantasy. A young man pushes an equally young woman on a rope swing that is tied to two palm trees. Below, two other women enjoy the day with their two pets. The border overflows with flowers and cascades of rich fabric. The colors are brilliantly applied and Huet’s use and control of vibrant color is on full display in “Swing”. It is a classic rococo style that Huet was a master of. This tapestry is lined and has a tunnel for easy hanging. Note: tapestry rod and tassels, where pictured, are purchased separately. Dimensions: W 27" x H 44"
Dimensions: W 39" x H 63"